Donna Karan, Kelly Ripa, Gabby Karan de Felice, Molly Sims and Rachel Zoe will host the 20th Anniversary of the Ovarian Cancer Research Fund Alliance’s (OCRFA) Super Saturday on Saturday, July 29th at Nova’s Ark Project in Water Mill, New York from 1:00PM – 6:00PM. 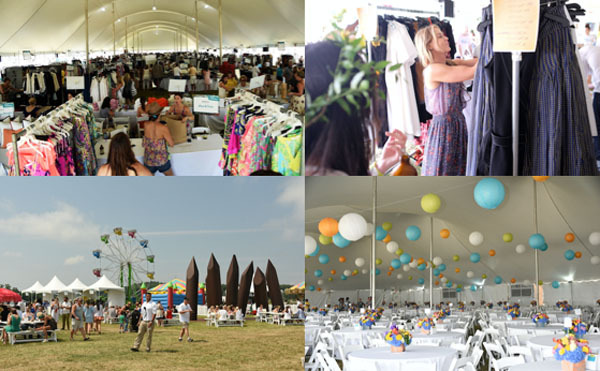 Super Saturday is OCRFA’s day-long, guilt-free charity shopping event complete with a designer items, kids’ carnival and activities, and gourmet treats, and is one of the most fashionable and successful annual fundraising events in the Hamptons. Together, Donna Karan and Liz Tilberis, the late and beloved Editor- in-Chief of Harper’s Bazaar and President of OCRF created the event in 1998. This year will honor the past 20 years of the charity shopping event. Donna Karan has sponsored and hosted the event since it’s founding, and Kelly Ripa has been a co-host since 2004. In 2016, OCRF merged with Ovarian Cancer National Alliance to become OCRFA, the voice for ovarian cancer. In addition to shopping luxury designers at deep discounts for a great cause, Super Saturday guests are invited to; have your hair styled by Conair hair gurus, experience a Reiki session from Urban Zen, get a mani on Kendra Scott’s manicab, make a flower crown at B Floral, snap a selfie with the Steven & Alexandra Cohen Foundation and Project Lyme, and spin with Northwell Health by hopping on a bike that creates artwork while you ride. Or bring the kids to Camp Divalysscious, for puppet shows, glitter tattoos, dance parties, musical appearances, and story time for moms, dads, and kids. With the most anticipated element being the fashion designer sale, discounted merchandise from nearly 125+ prominent participants will include: alice+Olivia, Bonpoint, Brooks Brothers, Carolina Herrera New York, DKNY, Karl Lagerfeld Paris, Kravet, L’AGENCE, Ramy Brook, Robert Graham, Suite 1521, Sigerson Morrison, Theory and Vilebrequin. Super Saturday 2016 raised nearly $3.5 million for OCRFA’s research and support programs. Ticket prices for OCRFA’s Super Saturday are $450 (regular), $650 (preview) and $850 (VIP preview) for adults and $150 for kids ages 5-16 (kids under 5 are admitted free). The preview ticket includes access to an exclusive shopping hour from 12:00PM – 1:00PM and a Gift Bag. In addition to the preview ticket benefits, the VIP preview ticket includes VIP tent access and VIP concierge services. Tables and sponsor packages are also available beginning at $2,500. To purchase tickets or for more information, please call London Misher Public Relations at 212.759.2800 or visit Ovarian Cancer Research Fund Alliance’s website, www.ocrfa.org/supersaturday.